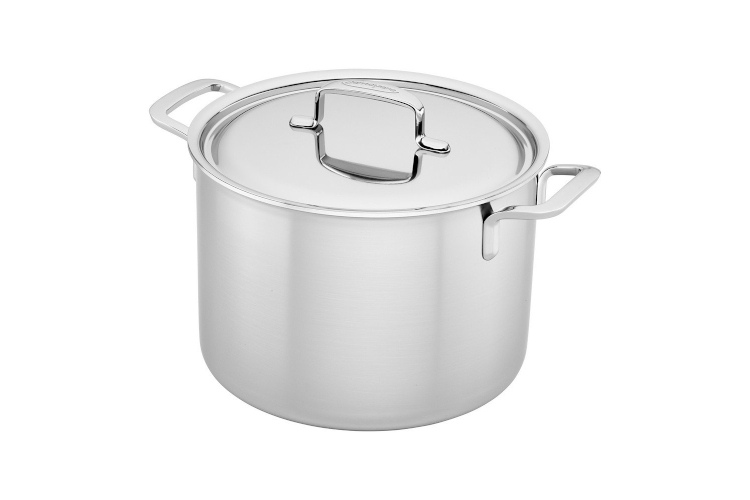 Designed to meet the demands of busy restaurant kitchens, the Industry 8-qt Stainless Steel Stock Pot cooks up delicious one-pot meals, succulent roasts, savory stews and comforting chili. Thanks to its chef-friendly features— like a dripless pouring rim and ergonomic, stay-cool handles—this premium pot is a pleasure to cook with. Boasting a sturdy 5-ply construction and Demeyere's signature flat base technology, this versatile Dutch Oven provides superior heat conduction, retention and distribution for perfectly cooked food. The large surface area and straight sides allow you to conveniently brown, braise and simmer in the same pot. The revolutionary Silvinox surface treatment removes impurities, maintaining a flawless, silvery white finish that looks like new even after years of use.